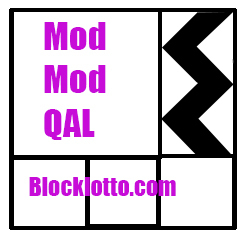 Here’s the last Mod-Mod QAL update (and the only one you need to make the quilts). I have finished one of my quilts and will share a photo in a separate post. 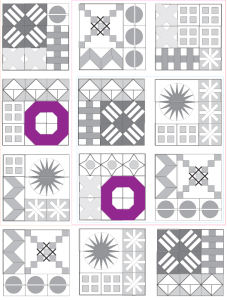 I hope you will all fee free to look at my example–which is made as written and follows the layout example–to see what you like and don’t like and adjust as necessary to make your quilt one you will love. 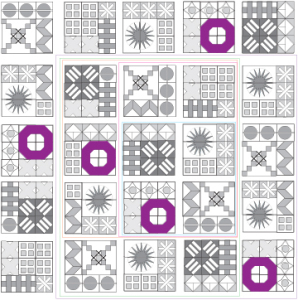 Here’s the updated chart how many blocks we made so far in the Block Lotto that you’ll need to make each size/version of the quilt. I said last month that if you were playing along (or following along), you already know where the Big O blocks go in each of the layouts. 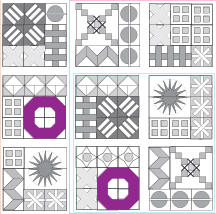 Here are the quilt layouts for each size, with the Big O blocks highlighted. 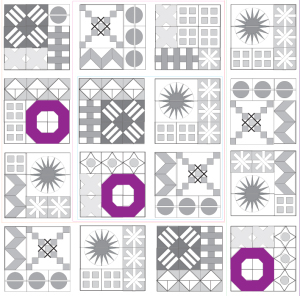 If you are making blocks (or thinking about making blocks), please do blog about it here. 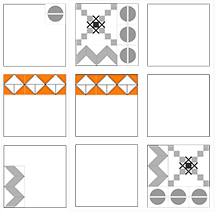 Use the category my sampler and the tag mod mod qal. This will make it easy for someone to take a quick look at what others are up to by looking at posts in the my sampler category.